New York Fashion Week kicks off Wednesday, with hundreds of designers showcasing their latest collections in back-to-back runway shows and presentations. What is fundamentally a trade event — an occasion for press and buyers to see next season’s looks and plan accordingly — has become increasingly consumer facing. Pressure for the brands has never been greater, as teams must consider how to showcase their products as quickly as possible to a huge digital audience. Standing out from the noise has become the greatest challenge no matter the size of the organization. Here are 11 do’s and don’ts for fashion’s big show. Don’t post weak visuals. This is rule No. 1 for fashion week, a time when Instagram and Twitter are overwhelmed with blurry photos and videos of models as they walk past the front row. No one cares about mere proof that you were there; but they do care about Fashion Week more broadly, so give them something they can’t otherwise see. If you want engagement, think more like Dolce & Gabbana instead: a brand that consistently delivers beautiful still and motion imagery, real time or otherwise. With today’s devices, there’s no excuse for anything but. Do think beyond the "like." What are you actually trying to achieve during Fashion Week? This is one of the noisiest times of the year in this industry, so be prepared to put the legwork in to be able to get the sort of numbers you want out. Your first challenge, therefore, is figuring out exactly what your objectives are, and accepting the fact they may be different from what you usually push for. Are you looking to build awareness? Drive traffic? Increase brand affinity? Or actually influence conversions? Apply your answer to the channels you use. Do determine the channels most suited to your brand. Just because it’s a noisy time of year, don’t feel like you have to jump on every channel because you can, and whatever you do don’t just blind spray the same content across them all. Facebook needs to be different from Pinterest, which needs to be different from Instagram. And you’ll need to consider video, too. If resources are limited, use them wisely by prioritizing which of the big platforms are right for your consumers. Who are you trying to reach, and where are they? It’s worth remembering much of the online Fashion Week crowd won’t be your current customers, but they could be your future ones; targeting them could be quite a different move, so think through how best to capture their attention. Don’t be scared to experiment. As much as it’s sensible to have a strong base strategy going into Fashion Week, it’s also a time ripe for experimentation. Take risks by trying out new channels and thinking about what you could do on some of the more niche ones. In the past, Fashion Week has seen some great campaign work on the likes of Spotify by Zac Posen, Skype by Victoria Beckham, and WeChat by Burberry. Expect Snapchat to be another platform to make a splash this season. And if something just doesn’t work for you, step away from it. The beauty of digital is being forgiven and forgotten very quickly — so cut your losses and refocus your efforts elsewhere. Do think about what will stand out. Snapchat will of course only get you so far. If brand awareness is your goal, then press coverage is key. If you’ve got the resources, go big by considering true innovation. Sometimes it might be seen as a gimmick, but it works. Fendi is a strong example. 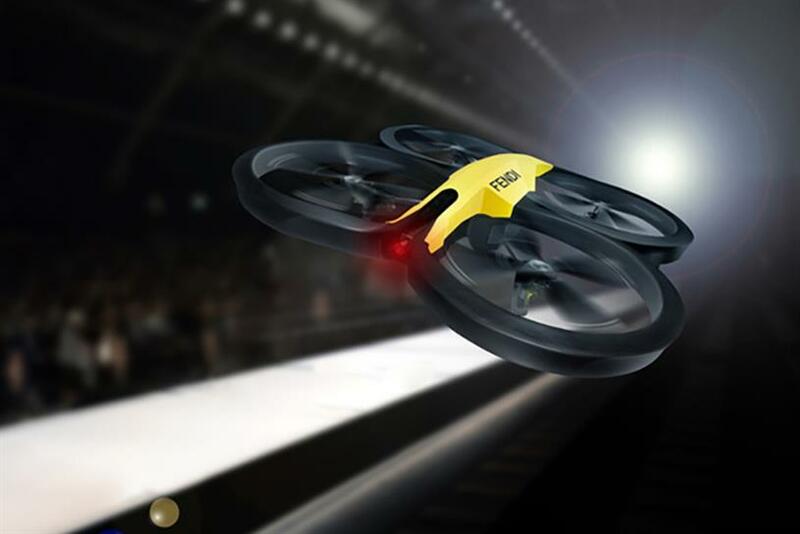 In February 2014 it introduced drones flying above its Milan Fashion Week show, recording the models as they walked out and beaming that footage back in real time to fans watching at home. The quality was terrible, but every major press outlet reported on it. Do take advantage of organic content about your brand. If you’re directly involved with Fashion Week, it’s quite likely a lot of content will be generated on your behalf. Use it! Chanel has frequently been one of the most hashtagged fashion brands on Instagram, which helped it generate an enormous 2.4 million followers via @chanelofficial before it even posted any of its of its own content on there. (It finally did for the first time in October 2014.) Retweet or regram your influencers, integrate their posts into your own digital assets, and strive to push that advocacy further. Don’t forget to interact with your fans. Social media is not a one-way channel, but it’s still very much considered so by many designer brands. Fashion Week is an ideal time to break that code and interact more regularly with existing and aspiring consumers. Rebecca Minkoff is a great brand to look at for inspiration. It took the idea of direct engagement a step further last season by involving Instagram fans in a critical decision related to the show: which of two looks would walk the runway. It was an incredibly simple post featuring two shots side by side with the opportunity for followers to vote. It worked. Do partner with influencers. Beyond the reposts and the interactions, think about setting up more strategic relationships with influencers in the space. They don’t have to be bloggers; perhaps they’re Instagram artists or Pinterest stars. Tommy Hilfiger in September 2014 introduced what it referred to as its "First Timers" campaign, giving access to a group of digital influencers from outside the fashion industry. Experts from the worlds of music, art, floristry, travel and architecture were all invited. Tumblr also runs a scheme every season that sees up-and-coming artists and photographers on its channel, taken on tour throughout Fashion Week; they hit some of the big shows, meet the designers and enhance their own networks. Open up your space to influential outsiders. Do back all of this with budget. Free only goes so far these days. Partnerships take money. Content takes money. Most important: If you really want to target specific sets of customers, boosting your presence with real media spend is what makes all the difference. Think about doing so in real time, reacting to what is working and getting behind it to push it further. Do think beyond the moment. It’s easy to get carried away during Fashion Week in a bid to keep up with what everyone else is doing. The amount of incredible visual assets at your disposal certainly helps, but don’t forget about what that means for your digital profile the rest of the year. Brands that enjoy the best engagement are the ones that maintain the quality, volume and velocity of Fashion Week long after the liv stream. Look to Victoria’s Secret for inspiration: Its annual show has become an entertainment property in its own right, and the content it surrounds it with is equally commendable. Or maybe … Don’t bother. If you’re not already an integral part of Fashion Week — set up with a scheduled slot for your show or presentation — consider how necessary it is to bid for relevance. Yes, there are opportunities for digital engagement, but it’s even easier to just get lost in the noise entirely. If you have something to launch, truly consider a different time of year before you use up valuable resource — not only might your consumers pay more attention, but so will others in the industry. This is, after all, a trade event at its very heart.